The council should exclude direct and indirect investment in all companies whose main business is the extraction of fossil fuels. By doing so, Dunedin would be joining 24 cities in the US: Seattle WA, San Francisco CA, Portland OR, Eugene OR, Berkeley CA, Richmond CA, Santa Monica CA, Boulder CO, Santa Fe NM, Madison WI, Bayfield WI, State College PA, Ithaca NY, Truro MA, Provincetown MA, Providence RI, Cambridge MA, Northampton MA, Ann Arbor MI, Boxtel NL, New London CT and Amherst MA. Worldwide, oil, coal and gas companies have plans to dig up 5 times more CO2 we can afford to burn in order to give ourselves an 80% chance of keeping global warming to 2 degrees C. Investing in fossil fuels is to ignore this truth. It is to willfully ignore the science, which has been clearly enunciated by the latest IPCC report just released, and instead invest in climate change. 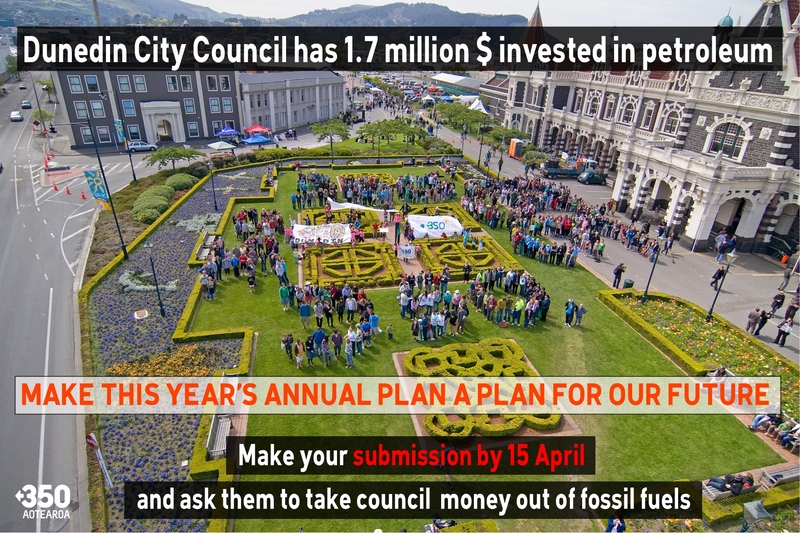 Investing in fossil fuels makes the Dunedin City Council part of the problem for future generations, rather than being responsible leaders and working towards solutions to this problem. But it’s not just a problem for future generations; climate change is already having an effect. In Dunedin, as in other coastal communities around the world, the threat of sea level rise and more violent storms is forcing towns and governments to make difficult choices — build higher, build stronger, or retreat. This council already faces these questions for south Dunedin and other areas, and the costs associated with them. To invest in the fueling of climate change is unethical and irresponsible. Dunedin should instead put its hand up as a solutions-based city like those US cities listed above, divest from fossil fuels and forge the way for other councils across New Zealand to follow.